This first appears over at TortureCast.com. Well here we are. The 2015 San Francisco Giants season is upon us. I thought I’d take this time to preview the season and throw out some predictions. I’m sure you’ve read the “big boy” publications and what they forecast for the season so I’m not going to even mention the fact that none of them are giving the Giants a chance to do big things this season. Nope. Won’t mention it at all. That whole odd year thing? I won’t mention that either. I’ve already previewed the starting rotation and the regulars. Here are some links. For the part 3 I’m going to take a pass at the other guys. It’s time to take a look at the Giants bullpen and bench players. It’s been reported over many Giants outlets that the team will carry 13 pitchers to start the season. If that is the case, here’s the guys that will be in the pen. First things first. New Giants GM Bobby Evans has shared the news that Vogelsong may actually get the start in game 2 this season. Jake Peavy has been fighting a dead arm (whatever that means) lately and it looks like Vogey will get the start in game 2. So the Giants will open the season with a 6-man rotation and then clean it back up to 5 guys after the first turn. How does that affect the other guys? Well it just means that Kontos and Machi both make the club for now. The Giants will have to make a decision on this by mid-April. For now though, both get a shot to stay and show what they have. Last season Machi really made a name for himself early on by being “the vulture”. He had 5 wins early and was a dominant relief man. So much so that this guy tabbed him as a future closer. I’ve backed off that for now. Let’s see how Machi rebounds from appearing in a career high 71 games last year. Yusmeiro Petit’s role is defined. He’s the swing man in this bullpen and Giants fans are happy to have him. He can start in a pinch as well as gobble up innings if a starter falters. Petit is deceptive to hitters because he hides the ball well during his delivery. He seems comfortable in the role. I mean, who else is going to give you 6 innings in extras during a playoff game? No one, that’s who. Yusmeiro Petit is a stud. The “core 4” of the pen is also back. These are the guys that have been a key to 3 championships in 5 years. From the left side there’s Lopez and Affeldt. It’s extremely hard to homer off Lopez and he strands base runners like it’s nothing. Affeldt is a guy that can not only get leftys out, he’s tough on the rightys too. He can give you more than an inning if needed. You may remember him doing that during a certain Game 7 last year. On the other side is Casilla and Romo. Both have been closers for championship clubs. It was expected that Casilla will close and Romo set up but Bruce Bochy has said that both guys will get a chance to finish games this season. Last season was one of Casilla’s best as he held opponents to a paltry .177 batting average against and had a 1.70 ERA. That was his career best and fifth lowest by a reliever in the NL last season. Romo lost his closer role last season but his slider has looked sharp this spring and he seems to have developed a sinker as well. Can he return to 2012 form? I don’t know, but I do know it’s a good problem to have. The roster has been set and with the news that the Giants will carry 13 pitchers that means the bench will be short. Here’s the short list. That’s it. That’s the whole list. 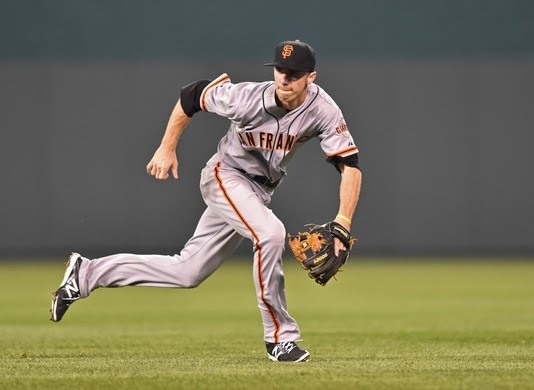 The big news out of this is that Matt Duffy has made the roster as a super duper utility guy. He batted .361 this spring and showed he has a little pop with 3 home runs. Duffy can play anywhere on the infield and was seen shagging balls in the outfield as well. His versatility is one of the reasons the Giants can go with a shorter bench to open 2015. Justin Maxwell is another surprise. He was a non-roster invitee to spring training this year and with the injury to Hunter Pence was given an opportunity. He’s a 6-year veteran who has spent time with the Nats, Astros, and Royals. By virtue of his .347 batting average and ability to play all 3 OF spots he seemed a natural choice to make the club. He’s never had any sustained success at the big league level but maybe this is the year. After all, the man grew up a Giants fan and loved Barry Bonds as a kid. Didn’t we all? It’s good to see Hector Sanchez back. His 2014 ended in ugly fashion after he sustained a concussion and then had more symptoms as he tried to make it back to the big club. He’s turned in to Tim Lincecum’s personal caddy and that’s not a bad thing. It gives Buster Posey time off to play 1st base. That’s especially good because when catching Lincecum the body gets beat up. There will be many occasions when we all say “Poor Hector” this season as we watch him take a beating. The switch-hitter is no slouch at the plate either and can drive a ball out of any park. The odd man out in all this is Ehire Adrianza. He has been designated for assignment and has to clear waivers before being sent down to the minors. Personally I think he’ll be snatched up by some other team much like Gary Brown was grabbed by the Cardinals. Adrianza has had many opportunities to establish himself in the bigs but never quite got it all together. If no one picks him up he’ll be valuable during the season if Duffy struggles or someone gets hurt. For now though he plays the waiting game. Well that’s it. That’s my preview of the 2015 San Francisco Giants. I had originally planned to make some predictions but I’m going to save those for our season opening podcast. Make sure to tune in when it goes up this week. Baseball is back and the Giants are defending champs. Time to sit back, relax, and enjoy our favorite pastime for another year.